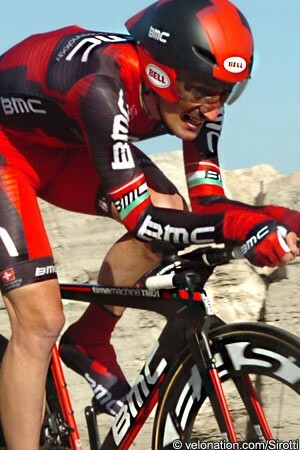 Marco Pinotti (BMC Racing) faces at least a week off his bike after suffering a crash in the time trial stage of the Tour Méditerranéen today, fracturing two ribs and injuring his shoulder. The 24km course between le Cap d’Agde and the Mont-Saint-Clair above Sète - which was a reversal of the final kilometres of the 13th stage of last year’s Tour de France - traversed the narrow, exposed causeway between the Mediterranean and an inland lake, the Étang de Thau, where the Italian was blown off his bike by the strong winds. "It was a tailwind on that section and I crashed a couple meters after the corner," Pinotti said. "It was probably the wind because I didn't crash exactly on the corner. I was still coming out of it, turning left and the wind was coming from the left." Pinotti managed to remount his bike - as he was passed by eventual stage winner Lars Boom (Blanco) - and completed the stage. "It was really painful to breathe, but after five or six minutes I decided to finish the race because it was only four kilometres," he explained. The Tour Méditerranéen was Pinotti’s first race of the 2013 season, which has begun as he ended 2012. The former Italian time trial champion crashed badly during the World championship time trial on September 19th, fracturing his collarbone. "He injured the collarbone at the same site where he injured it before," BMC Racing Team doctor Scott Major confirmed about today’s crash. "The ribs he broke are more like hairline fractures and are not displaced, so he had no injuries to his lungs, kidney or spleen. He does have a lot of abrasions on his left side: his back, his shoulder and his hip. “He will probably be off his bike for seven to 10 days and then the medical team will re-evaluate things before we decide how quickly he can start training again," Major added.